As we all know, there are hundreds if not thousands of cool apps in the marketplace today. So, each month we like to spotlight a couple of our absolute favorites. Today we are taking a closer look at Fleksy. Fleksy is the most fun, customizable way to type, and officially the fastest keyboard in the world. Fleksy is the only keyboard that allows you to find and send GIFs, and customize your keyboard with powerful Extensions and colorful themes. POWERFUL EXTENSIONS FOR CUSTOM FUNCTIONALITY Use Fleksy Extensions to customize your keyboard with incredibly powerful features. Have more fun with the ONLY Keyboard with GIF support and great autocorrect. Control your cursor from the spacebar with Cursor Control. Make Fleksy easier to reach on iPhone 6 and iPhone 6 Plus with One-Handed Typing. Or, customize Fleksy with an easy-access Number Row or keys of your choice. Fleksy gives you 3 slots FREE, so you can mix, match, and try all 7! THE FASTEST, MOST ACCURATE KEYBOARD Fleksy keyboard uses next-generation autocorrect so accurate you can type without even looking, and type with record-setting speed using intuitive gestures! Type faster and save more time for the things you love. BEAUTIFUL DESIGN. 35+ COLORFUL THEMES. 3 CUSTOMIZABLE SIZES. Show your style on Fleksy’s beautiful keyboard with over 35 free and purchasable colorful themes. Check out fan favorites like the Chameleon Theme that matches the color of the app you are in, the Frozen and Hunger Games themes, and our snazzy animated themes. TYPING THAT’S ACTUALLY FUN! Express yourself with GIFs, over 800 Emoji, 35+ themes, and Rainbow Key Pops. Then, earn fun Badges and rewards for using Fleksy! Who said typing had to be boring? MORE NATURAL GESTURES With just a swipe of your finger, easily add punctuation, space, delete words, and much more. Easy. Intuitive. Fast. WHY ARE WE BETTER THAN OTHER KEYBOARDS? • The only keyboard with custom Extensions. No keyboard is more customizable. • The only keyboard that holds a world record for typing speed. No keyboard is faster. 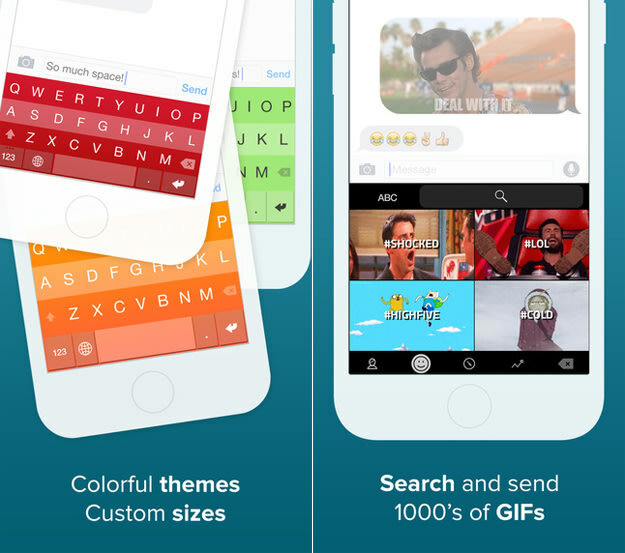 • The best keyboard to find and send GIFs while typing. No keyboard is more fun. • The most beautiful design, custom themes, and sizes. No keyboard is more beautiful.